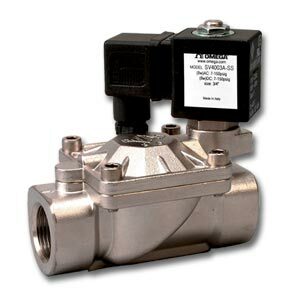 SV4000 Series 2-way hot water and steam solenoid valves are internally piloted. They feature brass and 316 stainless steel construction, and PTFE seal material. The temperature range of 0 to 182°C (32 to 360°F) and the PTFE O-ring make these valves ideal for media such as hot water and steam. A strain-relief connector is supplied with each unit. A ½” conduit plug is also available. 注: Comes complete with instruction sheet and cable grip connector.